After retiring in 2015, I decided to find a part time job to stay active. However, I stopped working after a year to concentrate on taking care of my sister. Six months on, I realised that I had to live more for myself and since I had more time on my hands, I wanted to keep myself occupied. I first heard about the Council for Third Age (C3A) exhibition in 2016 from an advertisement on the news. After some persuasion from a friend and out of sheer curiosity, I decided to go for the exhibition at Suntec City after my church service on Sunday. By chance, I learned about the volunteering opportunities that was offered by RSVP Singapore at the booth. For some reason, RSVP’s booth stood out to me as the term ‘rsvp’ is usually used in invitation letters and I felt that I was being invited to something new. I was interested in the Senior Guiding programme in the beginning and wanted to volunteer as a regular. However, I realised that I could not commit such long hours as I still had to commit to my sister and thus when I was introduced to the episodic volunteering programme in 2017, I signed up straightaway. As I currently live alone, I do not cook and often go out to have my meals. After months of volunteering at Willing Hearts (WH), I have picked up a new skill of handling different types of ingredients. The volunteers at WH really know their stuff when it comes to the various vegetables and through them, I learnt the different ways to maximise the shelf-life of the vegetables. Volunteering there gave me a chance to step out of my comfort zone and experience something I would not have tried – cooking. 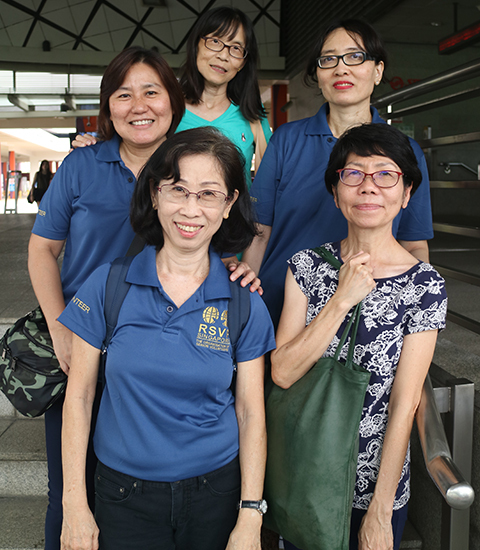 The best memory I have of the episodic programme is when we brought seniors from a senior activity centre on a maritime trail. Bringing the seniors out on the trail felt good as I was able to interact with them and talk about the memories we have at the different locations. Since I knew the history of some of the places too, I can relate to them better. If I could say something to potential volunteers, it would be to just come out, and mingle with people. You need to know what you want to do after you retire. I chose to expose myself to new things to regain my self-confidence, which in turn keeps me healthy. After working so many long, stressful hours before retiring, I have now chosen to relax by volunteering.